When I looked at my phone this morning and saw “December 23” I couldn’t believe it. Not only is it in the upper 70’s here in Charleston, but I’m working today and tomorrow. So it doesn’t quite feel like Christmas yet. Although, Greg and were super productive and in the holiday spirit this weekend. We finished our Christmas shopping, wrapped all of the presents, and I cleaned almost the entire house in preparation to go out of town for several days. Side note: When I was younger, I never understood why my mom spent so much time cleaning right before we left for vacation. What was the point?! I get it now!! I absolutely hate coming back home to a messy house when I already have a suitcase full of dirty laundry and am too exhausted from the travel to even think about cleaning. Nowadays I make a point to wash as much laundry, clean as many dishes, and vacum as many floors as possible before leaving town. Like mother like daughter! …almost. I’m not quite as clean as my mom. I already went over #1, #3, and #6 here. So how did I do on the rest? #2. I made pumpkin donuts and double chocolate pumpkin cupcakes. No pumpkin muffins this year, but I can’t complain. #4. Greg and I fulfilled this dream of going to a Panther’s game last weekend when they beat the Jets! It was so much fun spending the day in Charlotte and seeing my our boyfriend Cam in real live action. #5. We did roast marshmallows and make s’mores, but not over our own fire pit. Our backyard/patio is currently a much delayed work in progress as we wait for our patio stones to be delivered. #7. I made it to the Farmer’s Market once or twice this fall. It’s losing my interest though, unless I have a specific gift to buy or have out of town visitor’s. I have found the The Vegetable Bin (which I previously posted about here) has the same produce for much cheaper! #8. 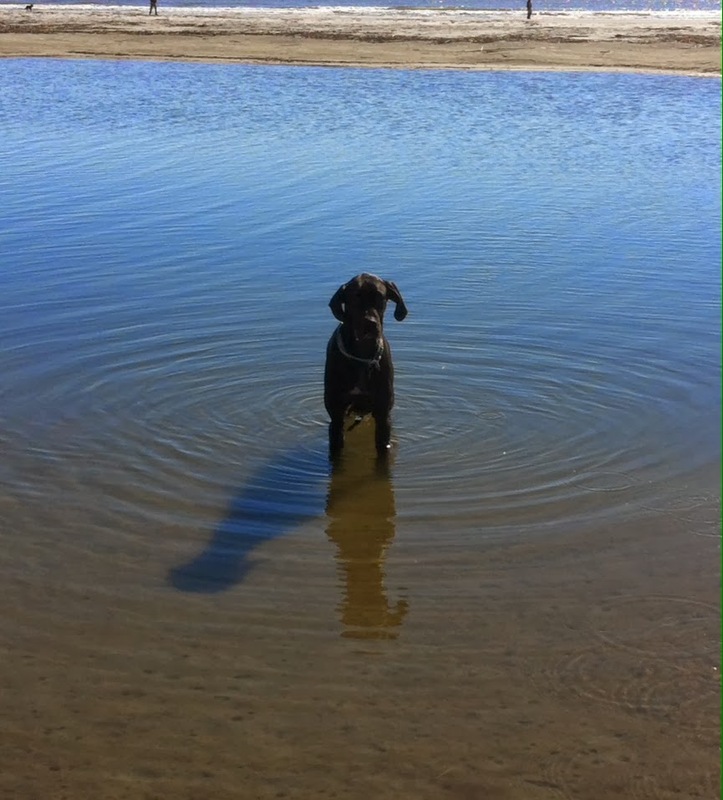 We took Zoey to the beach on Thanksgiving Day. Oh my goodness, she LOVED it. The beach that is, not the water. So you can imagine her fear when she accidentally chased another dog into some standing water and refused to move for 10 minutes. It was in the low 30’s outside, so the water was freezing as well. What a little baby!! Gotta love her. #9. 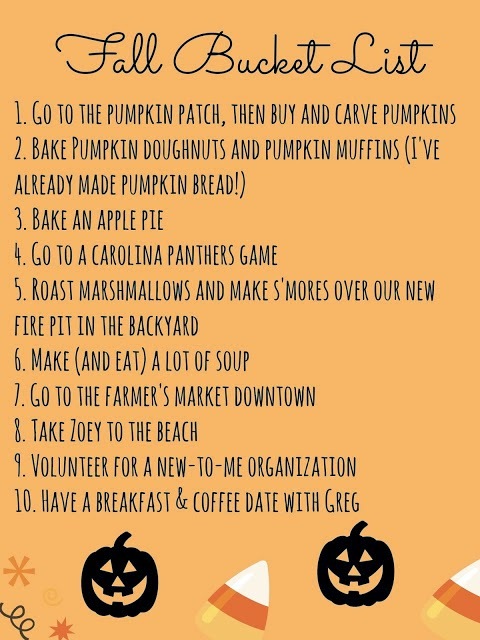 Okay so how terrible is it that the one thing I did NOT do on my list was volunteer? Ugh. #ImNotABadPersonIPromise! #10. 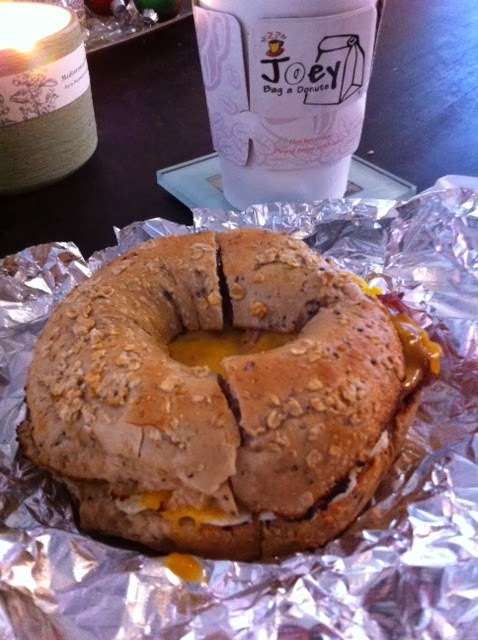 Although I love dates of all kinds, breakfast dates always feel so special to me. 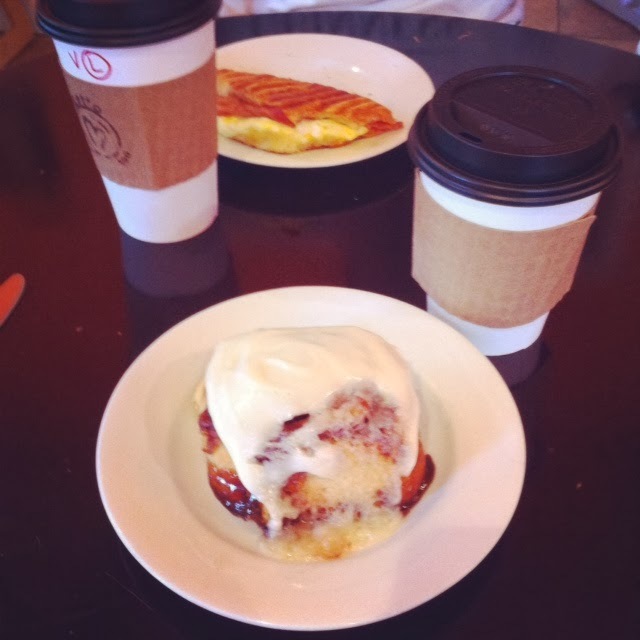 It’s nice to spend a lazy Saturday morning sipping coffee and eating a pastry with Greg by my side. With the hustle and bustle of our lives right now, it doesn’t get to happen often. I am happy to say we got to do this a few times this fall. And that’s it! Fall 2013 is history. Bring it on, Winter! (just as long as temperatures remain in the 60’s/70’s, even though I know that’s not happening). On another note, you may have noticed my serious decline in posting recently. To be honest, I don’t anticipate that changing for a few more weeks. Part of it has been due to the fact our wireless internet modem broke last week, so we’ve been disconnected whether we like it or not. And the other part of it is simply due to the extreme craziness of the holiday season. I’ll re-evaluate when we get back from visiting family in North Carolina and Ohio this week and next. Until then, MERRY CHRISTMAS, HAPPY NEW YEAR, AND VERY SAFE TRAVELS!!!! Good morning! I am getting a few hours of work in this morning before hitting the road for North Carolina this afternoon. Greg and I will spend a few days with his family, then will fly to Ohio to be with my family for a couple of days, then driving back home to Charleston for New Years with some of my family (while Greg will stay up north for a ski trip with his groomsmen). Whew. Lots of traveling going around here! But it’s going to be a great time and I cannot wait. I also know it’s going to go so quickly so I want to just enjoy it and soak it in as much as possible. Mariah Carey – All I Want for Christmas is You. Never gets old for me! Go ahead and click “play” while you read the rest of this post! Run on Christmas morning or take the day off? What do you usually eat on Christmas morning? My family always goes to the midnight mass on Christmas Eve, then goes back to my mom’s house to open presents that night (morning?). We don’t get to bed until 2-3am so sleeping in on Christmas is a must. Although, that doesn’t mean too much to me anymore since I wake up by 7:30 even when I try to sleep in. My step-dad cooks a pancake breakfast before my siblings and I go to my dad’s house for the rest of the day...where more food is served! 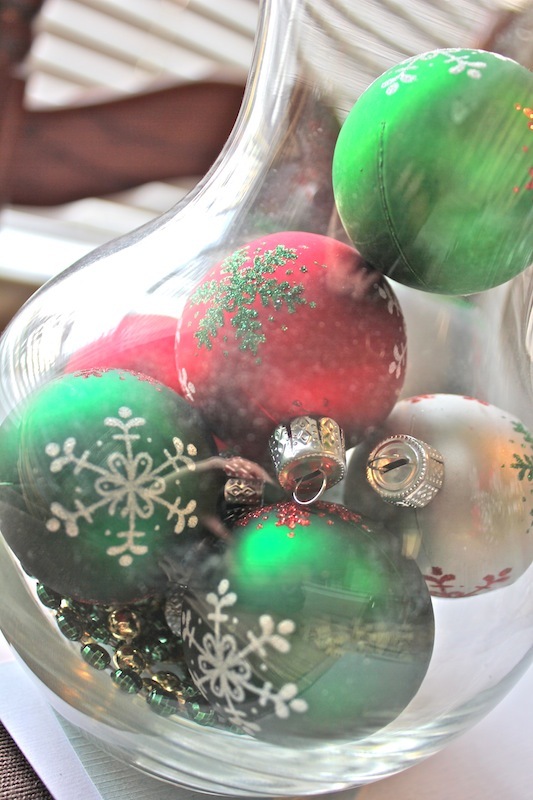 Favorite holiday or Christmas tradition? In conjunction with what I said above, I love my family’s tradition of midnight service, followed by opening presents in the middle of the night...one of the perks of having a split family (not that I recommend it in any way). There may or may not be some cookies and other treats involved throughout the night as well. But before all of that, we spend the evening with my mom’s entire side of the family at my aunt and uncle’s house playing games, watching Christmas movies and eating take-out Chinese food. Real tree, fake tree or no tree? Christmas pajamas… yay or nay? I am all for some cute, cozy PJs, but my family or I never dresses up in festive sleepwear. 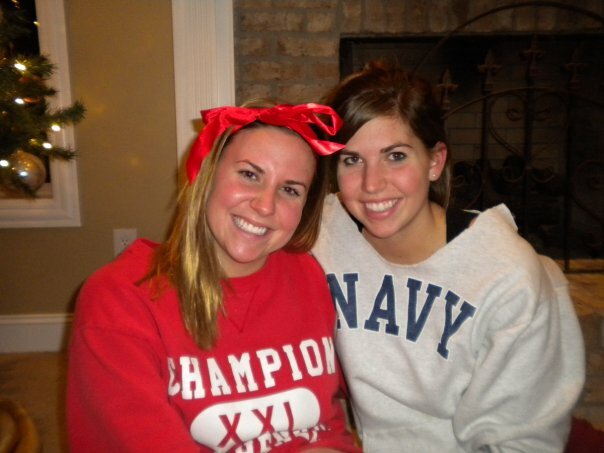 We change into comfy sweats as soon as we get home from church (as seen above), but no candy cane or Santa prints. Food that you always have during the holiday season? 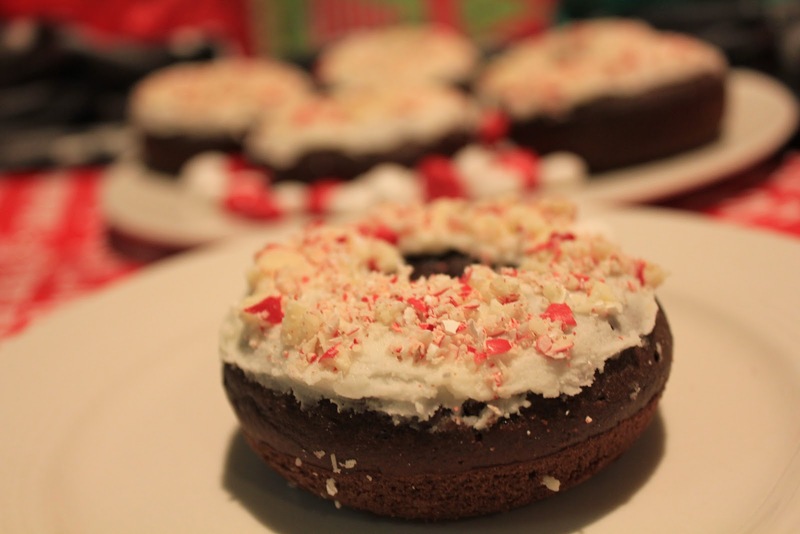 Favorite Christmas food/treat? 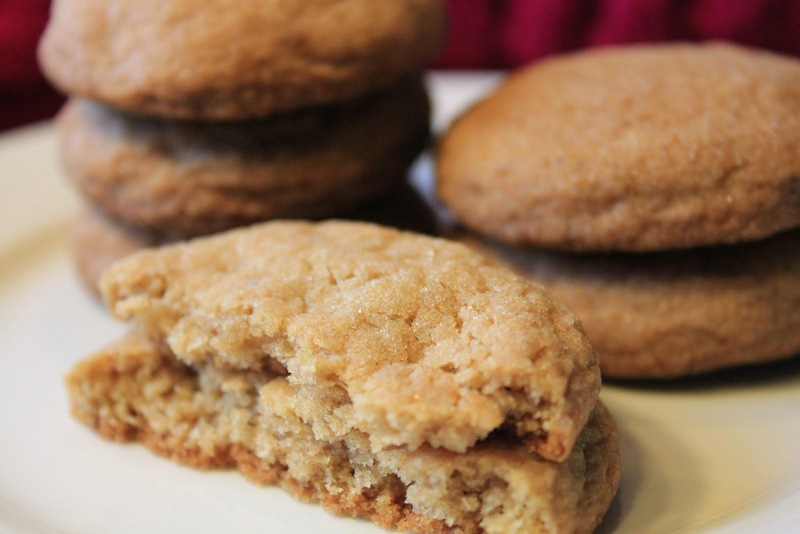 Snickerdoodles and sugar cookie cut-outs are the first treats that come to mind for this one. 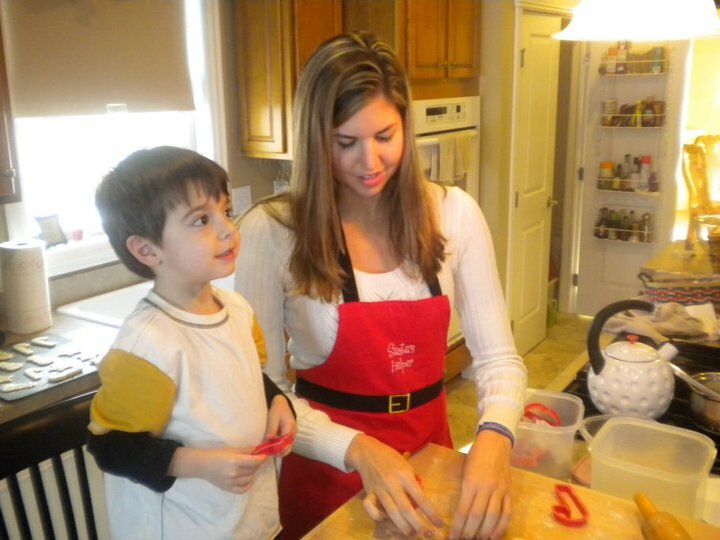 Baking with the little ones is always so much more fun. Although, then you have to compete for who gets to lick the wooden spoon! Open presents all at once or take turns? Take turns! We go around and each person opens one at a time, rotating around the room until all presents have been opened. Pretty much synonymous with Christmas time, huh? 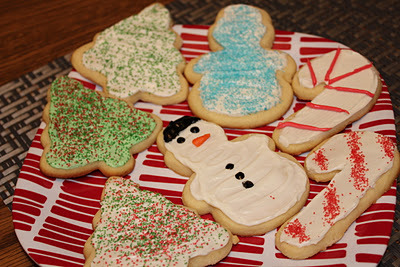 Frosted sugar cookie cut-outs and snickerdoodles are always at the top of my Christmas cookie list, but this year I was ready to invite a new guest to the party. 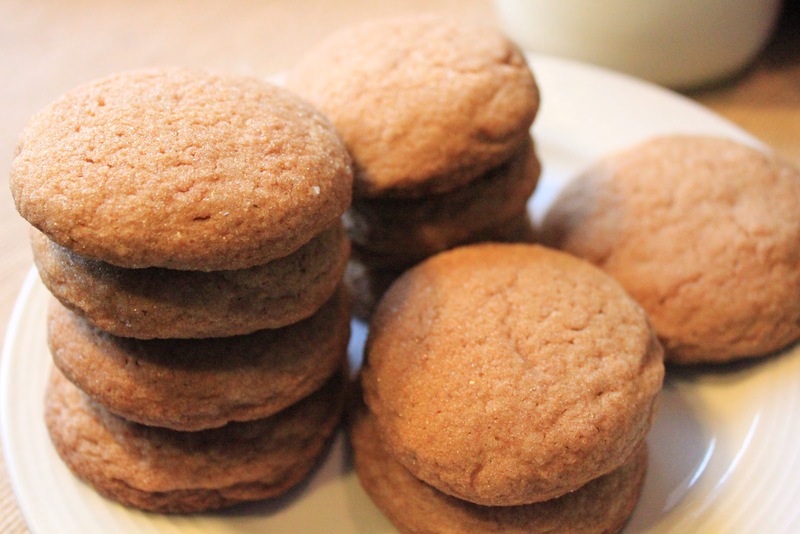 With the same flavor of a gingersnap, I was tempted to call these “gingerchews.” The spices warm your soul, especially if you eat one along with a hot cup of chai tea. Or a glass of milk. Either way, you’re living the good life. A puppy sleeping on my lap. The Christmas tree lit up behind me. My fiancé by my side. How the Grinch Stole Christmas on TV. 1. 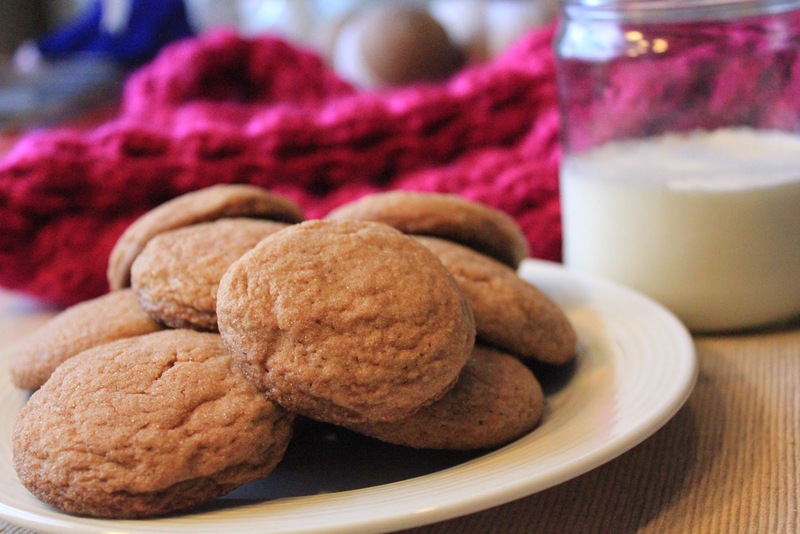 In a large bowl, whisk together flour, baking soda, ginger, cinnamon, nutmeg and salt. Set aside. 2. In the bowl of a stand-alone mixer, beat butter and sugars until smooth. While on low speed, incorporate the egg, water and honey (one item at a time). Beat until well incorporated. Gradually add flour mixture to the butter mixture while beating continuously on medium-low speed. Stop as needed to scrap down the sides of the bowl. Turn up speed and beat about one minute. 3. Place bowl in the fridge to chill for at least 15 minutes. 4. When ready to bake, heat oven to 350 degrees and spray cookie sheets with nonstick spray. Roll dough into balls, about one tablespoon in size, and roll in sugar. Place dough balls 2-3 inches apart on cookie sheet. Gently press down with the bottom of a glass (or any other flat, smooth surface). Bake 10-12 minutes. Remove from heat and let sit on pan for about 5 minutes. Transfer to cooling rack to cool completely. How festive am I today? Very. Very festive, would be the answer to my question. I may or may not even be wearing a tacky Christmas sweater t-shirt all day. Maybe it’s because I live in the South, but I was very surprised to find Walmart didn’t have any Christmas sweaters. Only t-shirts…in case your were curious. I have never been to a Tacky Christmas Sweater party and honestly was never one to be too amused by the whole thing anyway. But you know what? Things change. People change. And when your office is throwing a potluck holiday breakfast and asks people to show their spirit by wearing a holiday sweater (or t-shirt), you do it for goodness sakes. Ha! Now I’m just being weird. I think I might be a little slap-happy right now. 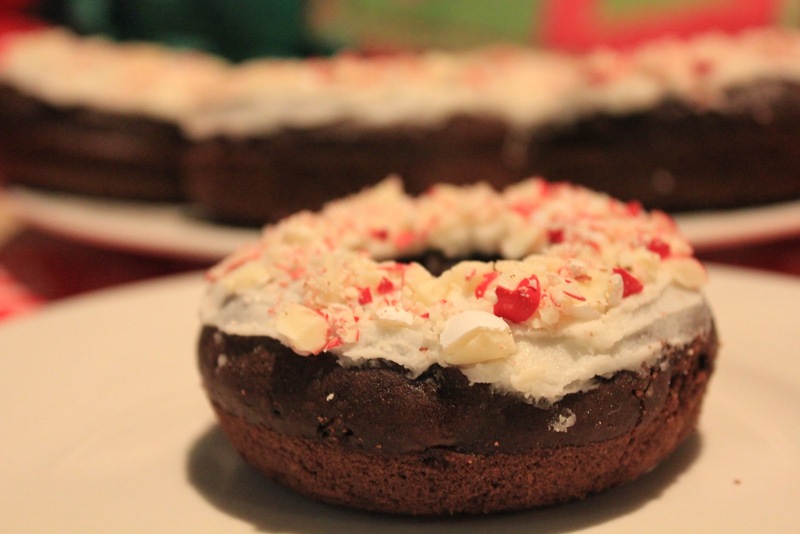 Or maybe you call it ate-too-much-peppermint-frosting-happy. These are hands down the best baked donuts I have made so far. The cake is moist, but not too moist. The frosting is the star of the show though. The thickness of the frosting helps it not to absorb right into the donut overnight, as I have experienced with other donuts in my day. 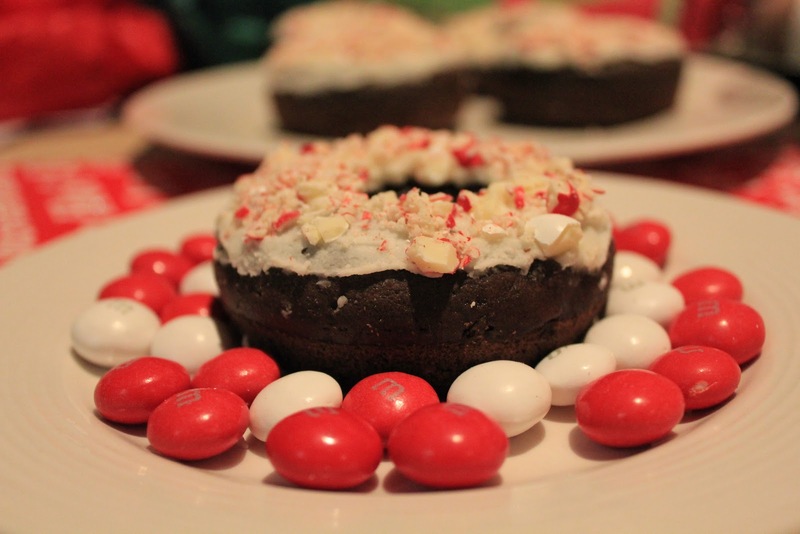 Then, they are topped with crushed White Chocolate Peppermint M&Ms. Yup. I need to go for a walk now. 1. Preheat oven to 325 degrees. Spray donut pan with nonstick spray and set aside. 2. 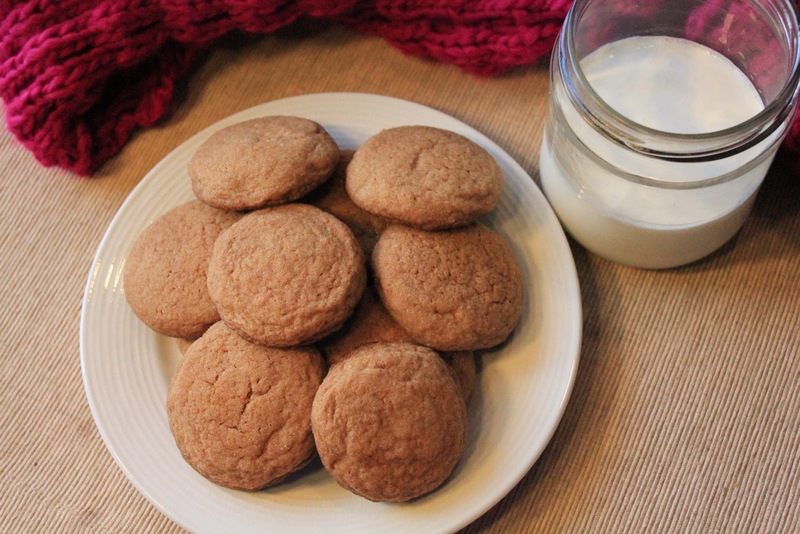 In a medium bowl, combine flour, cocoa powder, baking soda and salt. Whisk to combine. 3. In a separate bowl, combine milk and lemon juice. Stir and let sit about 2 minutes. Add brown sugar, egg and butter and vanilla extract. Whisk well to combine. Add wet mixture to dry mixture. Stir until there are no more lumps. 4. Pour into a large ziplock bag. 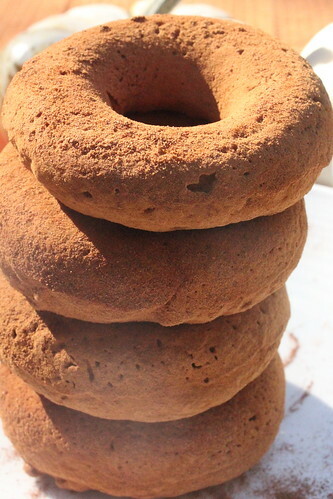 Cut off one corner at the bottom of the bag and squeeze batter into donut pan. 5. Bake 9-11 minutes or until toothpick inserted in the donuts comes out clean. Let cool in pan for 5-10 minutes. Transfer to wire cooling rack to finish cooling completely. 1. Add powdered sugar and butter to the bowl of a stand alone mixer. Beat about 1 minute until combined. 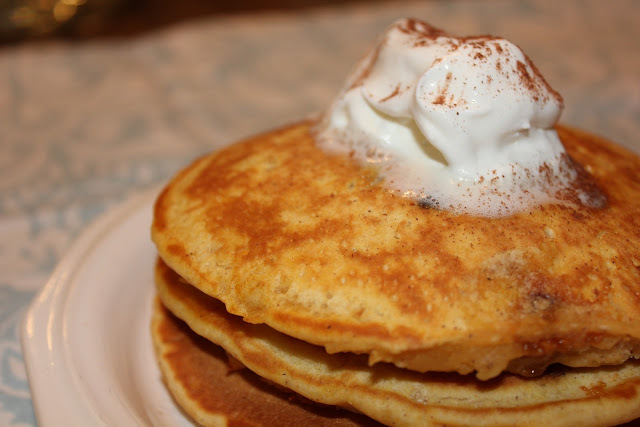 Add cream, vanilla and peppermint extracts. Continue to beat until smooth. 2. 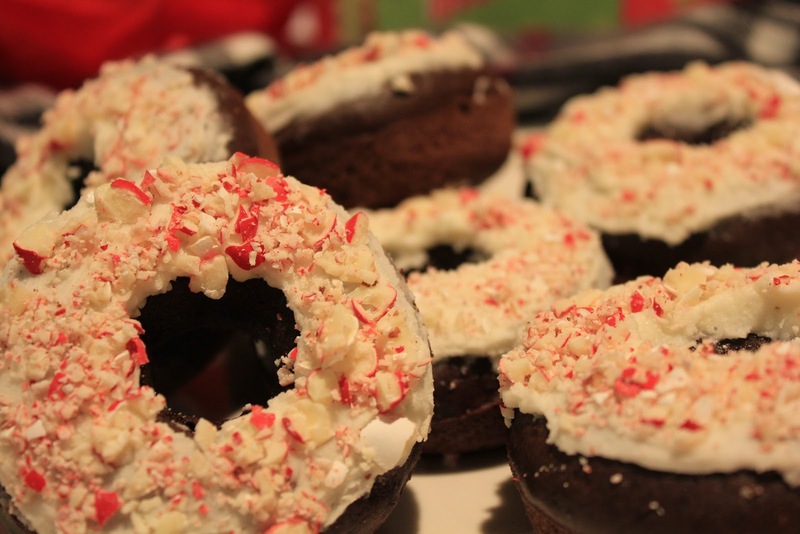 Use a butter knife to spread frosting onto donuts. 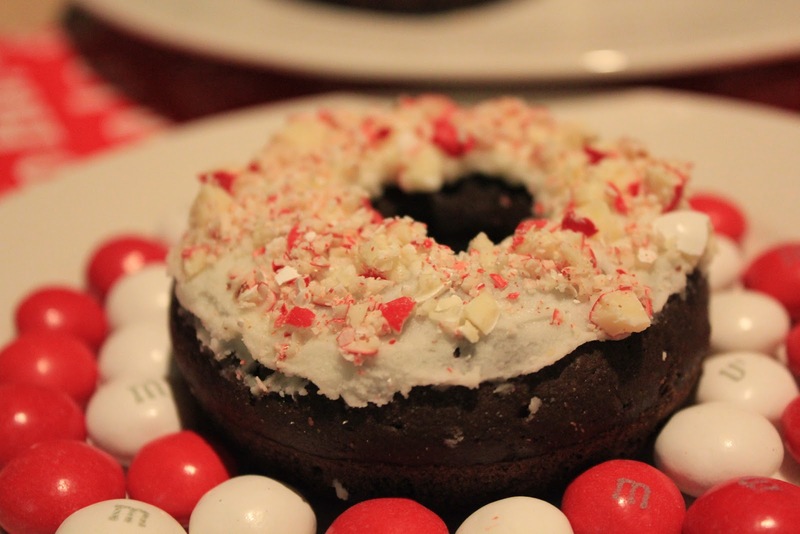 Immediately, sprinkle M&M crumbs over the top of the donuts. That’s my Southern speak for ya. I wonder if there will come a day when I don’t think twice about saying “y’all” versus “you guys.” I grew up in Ohio addressing a group of people using, “you guys” but living in the South for more than five years now has changed things. It seems natural to say “y’all” when I’m down here in Charleston (which is obviously the majority of the time). Then I go back to my hometown. If “y’all” slips out of my mouth, I suddenly feel self conscious. I will even try to catch myself and say “you guys” instead if I can help it. What’s not funny is this pie. 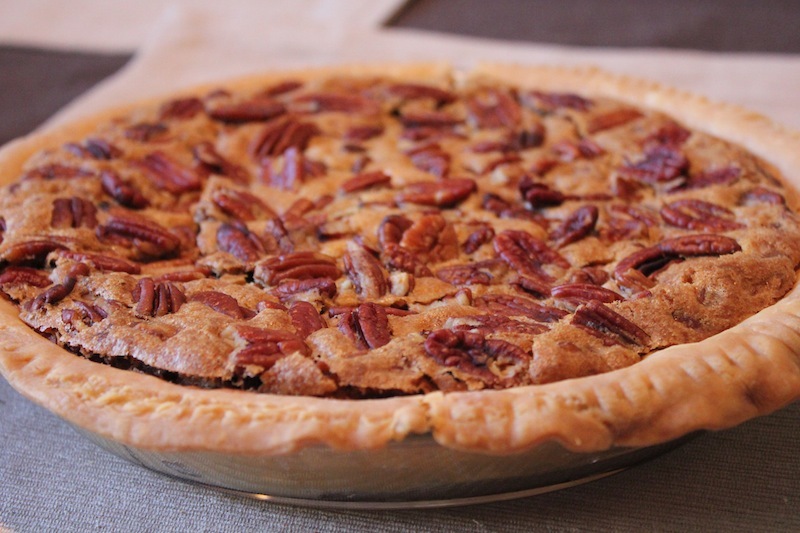 I followed a recipe in Southern Living and let me tell you, Southerners sure know how to make a pecan pie. The name itself made it hard to resist. 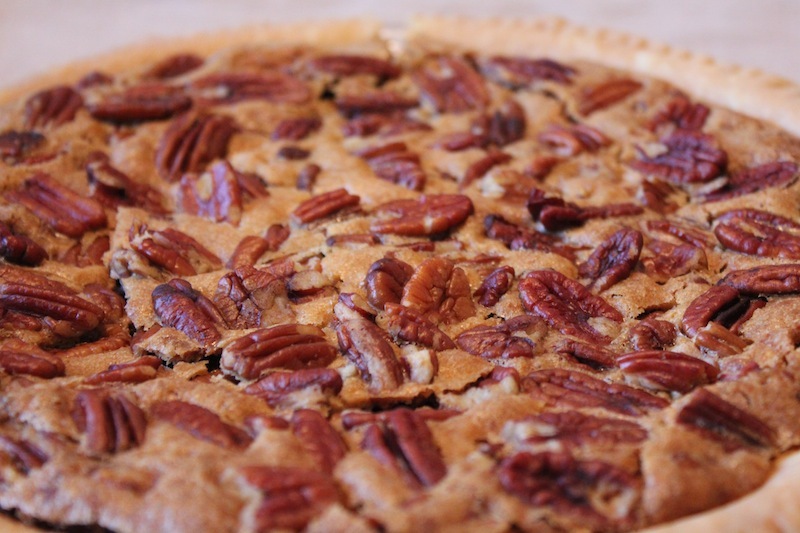 “Utterly Deadly Pecan Pie.” Um, yes. I think so. It really was almost the death of me on Thanksgiving. I think I ate half of it by myself throughout one single day. 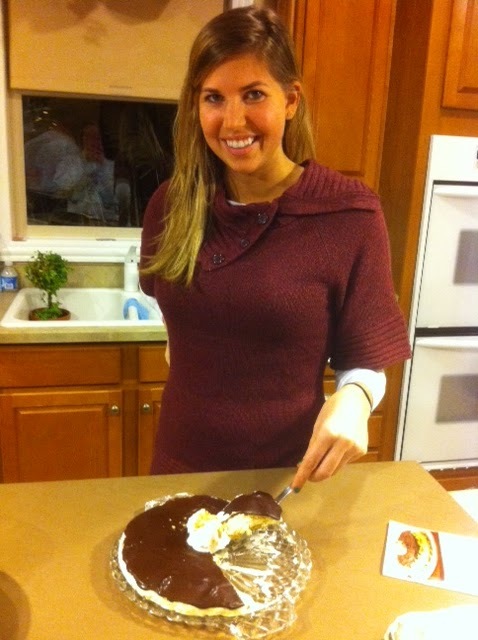 While I made this pie for Thanksgiving, I think it would be equally enjoyable at Christmas time. 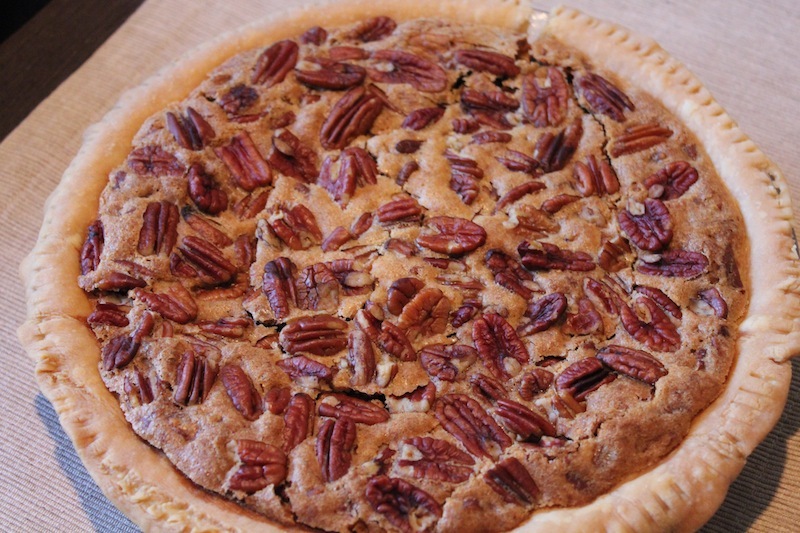 So, y’all go make this pie!! Bring it home for Christmas, your family will love you. Or just save it all for yourself. Either way, I won’t judge. 1. Preheat oven to 325 degrees. 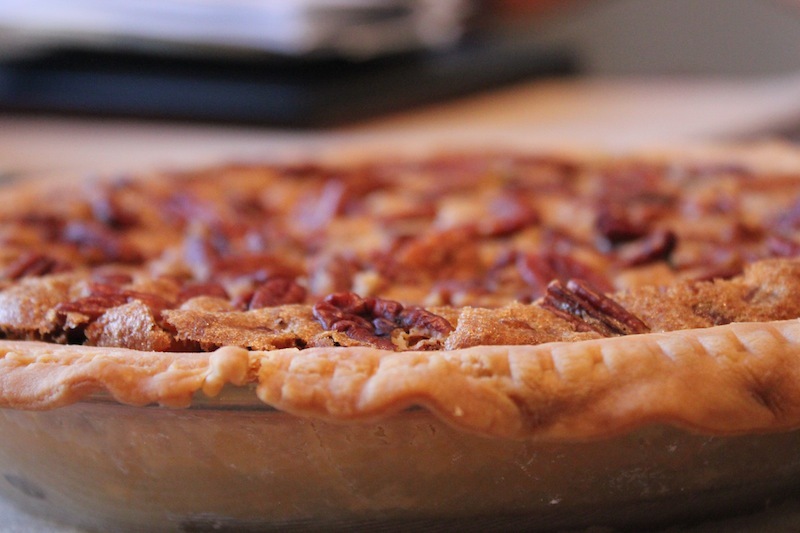 Fit piecrust into a 9-10 inch pie pan (Southern Living calls for a cast-iron skillet, which I don’t have.) Sprinkle piecrust with powdered sugar and set aside. 2. In a large bowl, whisk eggs until foamy. Whisk in brown sugar and the next six ingredients. 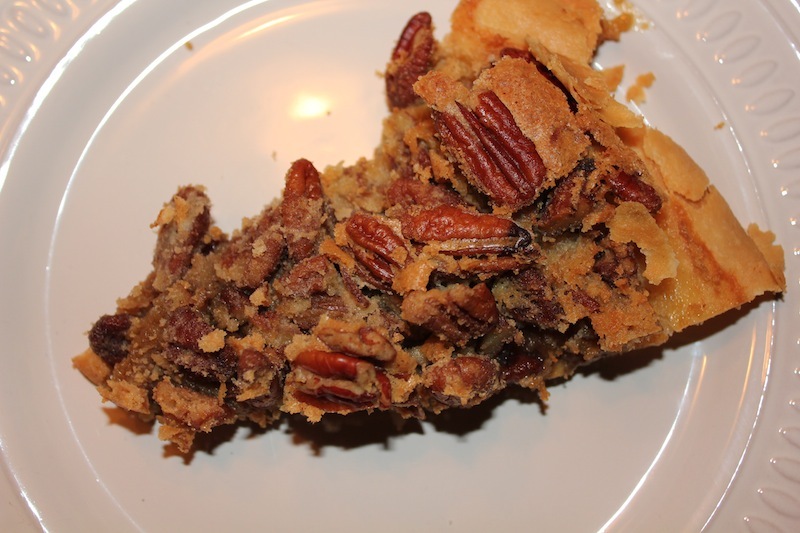 Pour mixture into piecrust and top with pecan halves. 3. Bake for 30 minutes, then reduce oven temperature to 300 degrees. Bake 30 more minutes. Turn oven off and let pie sit in oven for up to three hours. 4. Remove from oven, slice and serve! Happy December! If I wasn’t in the Christmas spirit before, I am now. I love this time of year as much as the next, but it always seems to take me a little time for it to hit me. 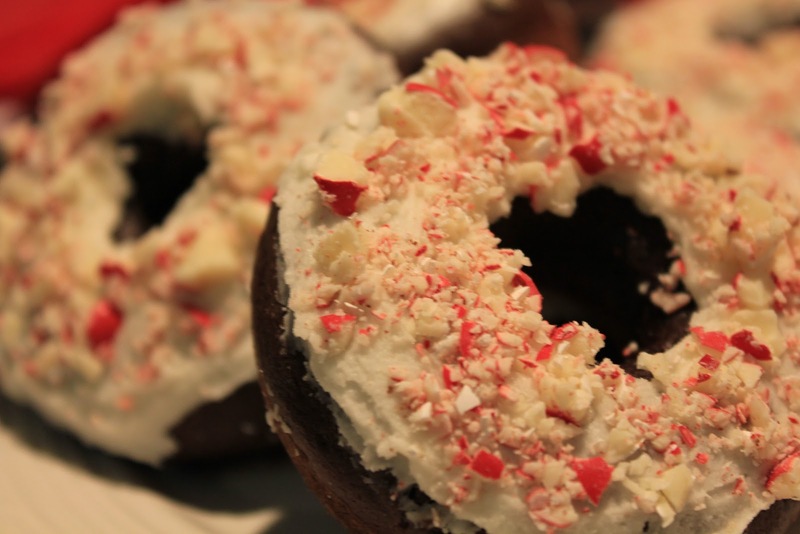 In the past week, we have put up our Christmas tree, listened to Christmas music and begun eating Christmas treats! 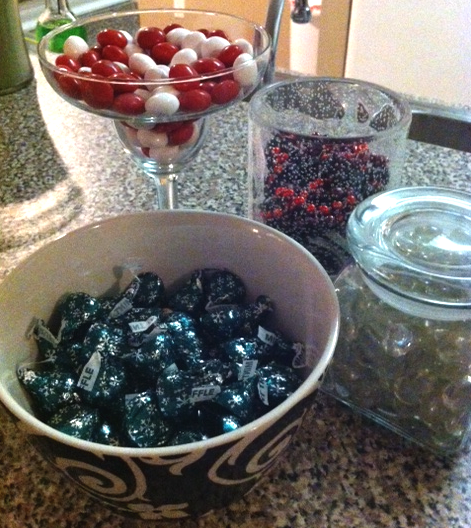 Speaking of which, have you tried Hershey’s Mint Truffles? You must!! They are my new favorite candy. Dark chocolate on the outside with a melty mint center. Ahhhhhhhhhhhhhh. Love them so much. 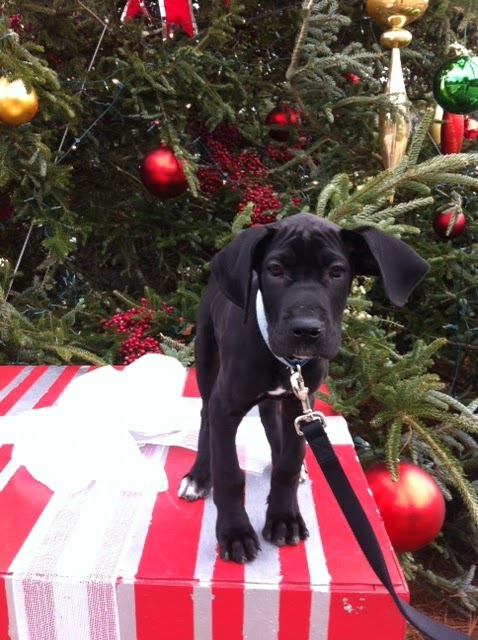 Anyway, there is so much to be thankful for this holiday season…besides the Christmas candy of course. In just a few short weeks we’ll be celebrating the birth of God’s only son and our savior. I can’t think of another birthday party I want to be a part of than this. As always, I am thankful for my family and friends to celebrate with, but most importantly I am thankful for God loving us so much that he sent Jesus to save us. Through all the ups and downs throughout the past year, the good days and the bad, the Christmas season really is the most wonderful time of the year. The holidays may be over, but I still have plenty of peppermint kisses laying around. If you haven’t tried Hershey’s Peppermint Kisses, you should. I bought a bag for myself and was even more excited when Greg’s mom Santa put some in my stocking on Christmas. 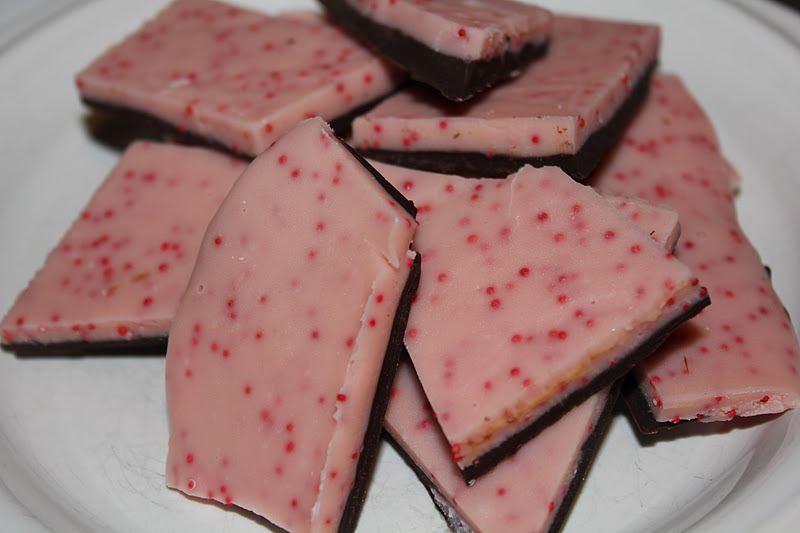 They are plenty good on their own, but here is another way to eat them: Peppermint bark. I am still yet to get back into the kitchen and cook or bake something for myself since vacation. I don’t count slicing apples and throwing together sandwiches cooking. So in the meantime I’ll show you what my mom made while I was home. 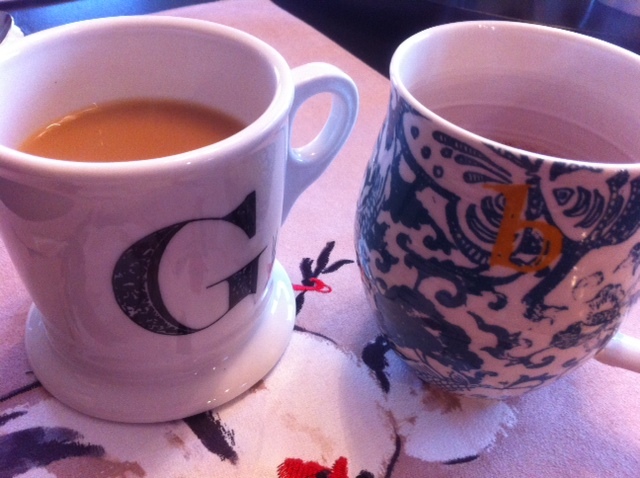 While my mom prepared breakfast, Greg and I drank out of our new mugs that Mom got us for Christmas. Coffee for Greg, tea for me. 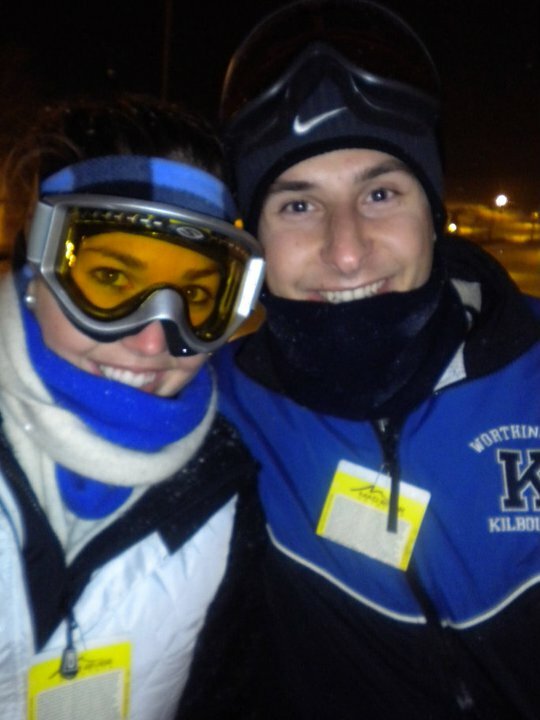 Aren’t they SO cute!? The funny thing is I have seen them twice on other blogs that I read. Must be a popular gift this year. But I still feel special. For breakfast we had the most gourmet french toast I’ve ever had. My mom went all out. She’s a pro at french toast. 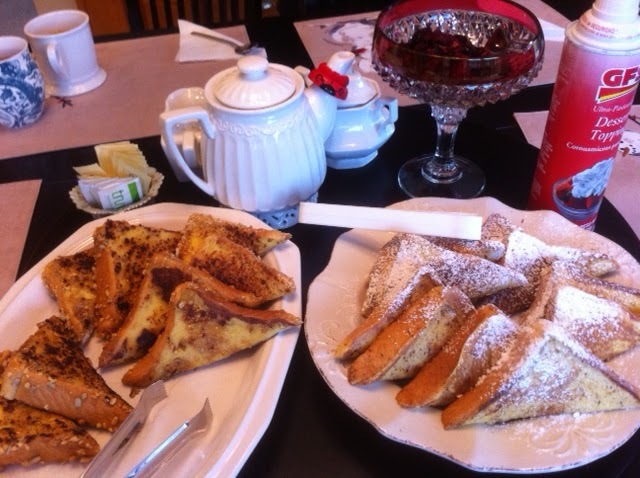 She made two different kinds: (1) Your standard french toast topped with powdered sugar and (2) vanilla granola battered toast. We also had mixed berries and whipped cream to top them with. As much as I love french toast, I am a little surprised I don’t make it for myself more. I think my love for pancakes is too strong. After an amazing dinner that Thom made on New Year’s Eve (no pictures…we were starving, ok? 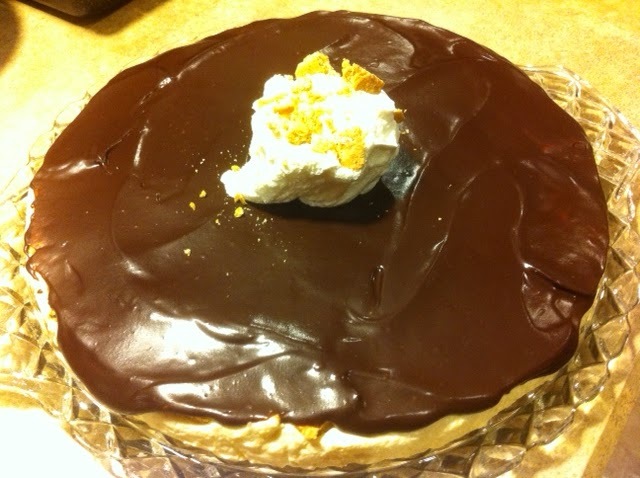 ), my mom made a Boston cream pie/cake/thing-a-ma-bob. She’s a beauty. I can’t take credit for much, except I did plop the whipped cream on top and garnished with graham cracker crumbs. Impressive, huh? Oh yeah, I also helped to eat half of the thing too. I won’t deny credit for that. We also had a great pizza dinner one night from Jet’s. My dad was so excited for me to experience Jet’s for the first time and it was just as good as he said. I tried the Hawaiian with a side salad and just one single boneless buffalo chicken wing. Maybe tonight will be the night I cook something again….the only question is, what should it be?